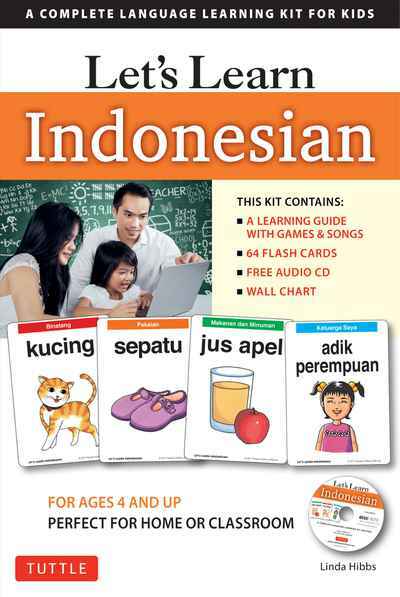 Let’s Learn Indonesian kit is an introductory Indonesian language learning tool especially designed to help children from preschool through early elementary level acquire basic words, phrases, and sentences in Indonesian in a fun and easy way. The flashcards can be used as a learning tool in a classroom setting, at home, or anywhere that learning takes place, and can easily be taped around the room for an interactive way to learn Indonesian. The set contains a total of 64 words organized into thematic categories, including: My Family, Colours, Animals, Food & Drink, My Body, Clothes, and Environment. All of the words are illustrated—the pictures serve as effective visual aids to help children learn and remember each word’s meaning. Words often reflect cultural objects and items and can be studied in any order. Learners may focus on one theme at a time or mix them up for a little more variety. Also included in this kit is an audio CD which provides native pronunciation of the words, and sample sentences for practice—sentences that children would use in everyday life. Songs are also included on the free audio CD. Finally, the kit also includes a wall chart featuring the front of each card for kids to review and a learning guide for teachers and/or parents with tips, activities and more!